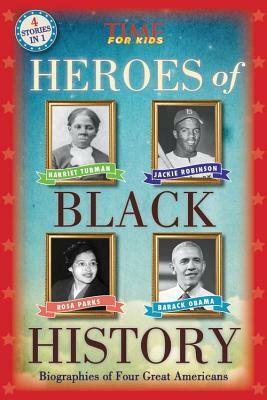 This paperback book has the subtitle Biographies of Four Great Americans, and includes information about Harriet Tubman, Jackie Robinson, Rosa Parks, and Barack Obama. Eacj entry gives a good overview of each person in under fifty pages. The text, which is about 18 point font, is accompanied by lots of photographs of the person being covered as well as relevant pictures of the time period or, in the case of Tubman, artistic renderings of events or people for which there are few photographs. Each chapter ends with a timeline, and additional full pages of information about pertinent topics add to readers' understanding of the historical eras. I was especially pleased with the timeline of Black History at the beginning of the book, as this will help readers put the biographies in perspective. An introduction by Charlanye Hunter-Gault also sets the stage for the information. Strengths: This is an engaging volume, and the mix of pictures and text will be pleasing to all readers, as will the slightly larger text size. It would make a great gift for children in grades 3-8 who like biographies.The page design, with chapter headings in larger text, captioned photographs, and sidebars, will be useful to teachers who want to delineate crucial nonfiction features. I also appreciate that this embraces the term "Black History"; "African-American" has never seemed like a helpful or precise term to me, and since the Black Lives Matter movement has readopted this slightly older term, I am glad to see it's wider use. Weaknesses: There are a huge number of books already available on each of the people covered, so I would have preferred the inclusion of somewhat more obscure, but no less important, people. What I really think: I am debating purchasing a copy for my middle school, since it would be a good resource for some of my struggling readers when they are assigned biography projects. A curriculum guide is available at timeincbooks.com/heroesguide. Hilo is enjoying reconnecting with his sister Izzy and hanging out with his Earth friends D.J. and Gina. It's sometimes hard for the two aliens to hide the quirks in their personalities, but they do their best. The newest challenge, however, is the fact that giant monsters are waking up all over the planet. Luckily, Hilo can fight them, and Gina has some new super powers that come in handy as well. Izzy reveals that back on their home planet, Hilo was a hero, who took advice from a scientist called Dr. Horizon. Dr. Horizon was working to defeat Razorwark, who had an army of evil robots at his command. The giant robots might be a legacy from this evil genius, and the friends work to control the menace as well as figure out their source. In the meantime, Gina has to fight with her mother about being a basketball cheerleader! Will Gina manage to keep her secret from her mother and still not have to cheer? 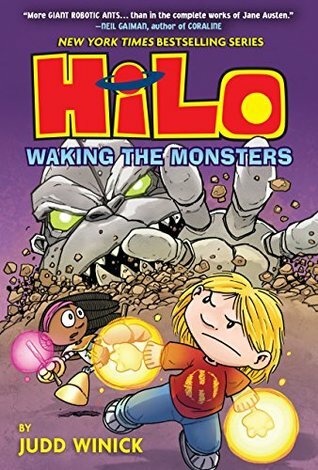 Will the monsters keep coming after Hilo? Will Izzy be able to shed light on the mysteries of his past that Hilo can't remember? We get some answers in this book, but also have enough questions remaining to look forward to a book five! Strengths: Winnick has really done his research into what middle grade readers want in a graphic novel. The characters are manageable, diverse, recognizable, and do grow a little in each book. The plots make sense, and continue from book to book without being confusing. The colors are bright, the picture to text ratio is good, and the text is in about a 14 point font, which is SO much better than the 8 point font in many graphic novels. This series can be enjoyed by strong readers in first grade, or by struggling readers in 6th because it is fast paced, things blow up, and it's funny. It's amazing how good a book can be when the author takes the target demographic seriously into account. Weaknesses: Izzy confuses me a bit. Small quibble. A bigger quibble is the paper over board book construction, which doesn't hold up well. On the plus side, they only run about $12, which isn't bad. The "library binding" is $16, but I have not seen a library binding produced in the last 20 years that is worth an extra four cents, much less four dollars. What I really think: This is an essential purchase for elementary and middle school libraries, and a great gift for a wide variety of readers! This was a must purchase for me. My third through fifth graders love the series and I always have students asking me when this 4th was going to be published. I haven't heard yet what students think but I know they will love it! Thanks for your compelling reviews this week. I haven't read most of them but hope to in the coming months. The saxophone story especially peaked my interest. Great nf selection - these are people everyone should know about. I just finished book 4 of HiLo last night. I think it might be my favorite graphic novel series for that age reader. The only problem I had was I had forgotten how book 3 ended! I was a bit confused at the start. Until you wrote it, I too would have thought that the book could include others. Even at the used bookstore, the most bios we have are about Dr. King & Rosa Parks. But perhaps this book adds new information. Thanks, Karen! We need more books like Heroes of Black History. I would have loved this format as a child. Like you I would prefer to hear the little known hero stories. That's when it is fun. I haven't read one HiLo book yet. However, I just plan to remedy this as soon as I finish reading all the books I have yet to read for the Cybil awards. I really enjoy the HiLo books. Heroes of Black History sounds very interesting. You are the second person today to recommend the HiLo series. I have only read a couple graphic novels, but I am going to check this one out. Thanks. I love your argument that more "obscure" leaders should have been chosen. It's an excellent point.